In just a few minutes, hatred upended their world. 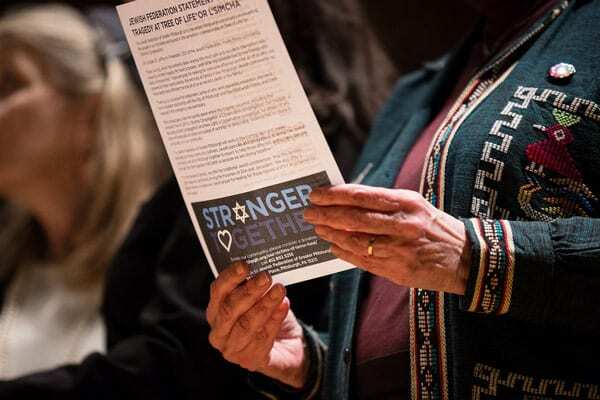 The families of the 11 men and women murdered in Pittsburgh’s Tree of Life Synagogue must face incomprehensible trauma and indescribable pain. All of us—their friends, neighbors, and community—are called to be with them and support the human work they do as they mourn and figure out how their lives can move on. If Saturday’s horror were just a tragic accident, that would be enough. But hanging over the moment are the shooter’s words. The killer selected his victims because they were Jews, and because a Jewish organization defended immigrants. He chose his victims because in his mind, which had evidently been whipped into a frenzy by Fox News and its adherents (including the president), Jews were in league with the brown immigrants he felt were destroying his country, and the president he supported did not match his words with action. This makes the tragedy more than personal. As difficult as it is to consider the larger societal meaning of hate and violence in the face of individual pain and suffering, we must ask if we can ignore or delay thinking about the bigger picture as we ease the pain of those directly hurt. The larger context is not difficult to see. Saturday’s tragedy occurred just days after the arrest of a man who had mailed bombs to political opponents of President Trump. Days earlier, another man killed two Black Kroger shoppers after he was unable to enter a Black church. It comes in the wake of efforts on social media to fan and amplify hateful and conspiratorial voices. It comes when mass violence is all too common, when shootings are the norm. It comes at a moment when our president and other elected officials regularly use their platforms to demonize immigrants, people of color, inner-city neighborhoods, the LBGTQ community, and the press. When President Trump announced during a TV interview that he planned to visit Pittsburgh on Tuesday, telling Laura Ingraham, “I’m just going to pay my respects…I’m also going to the hospital to see the officers and some of the people that were so badly hurt,” a challenge arose: Could the Jewish community, its leaders, and its organizations ignore the larger context? It’s now in their hands to decide whether they are best served by ignoring the president’s words and actions, or they are called by their values to speak out, seeing violence and speech as connected. For the past three years your words and your policies have emboldened a growing white nationalist movement. You yourself called the murderer evil, but yesterday’s violence is the direct culmination of your influence. Our Jewish community is not the only group you have targeted. You have also deliberately undermined the safety of people of color, Muslims, LGBTQ people, and people with disabilities. Yesterday’s massacre is not the first act of terror you incited against a minority group in our country. By Tuesday night, it had been signed by more than 75,000 individuals. Still, the president chose to come yesterday afternoon. Crowds of protesters came out in opposition. There are no words to express how devastated we are by the events in Pittsburgh this morning. This loss is our loss, and our thoughts are with Tree of Life Congregation, our local partner Jewish Family and Community Services (JFCS) of Pittsburgh, the city of Pittsburgh and all those affected by this senseless act of violence. As we try to process this horrifying tragedy, we pray that the American Jewish community and the country can find healing. Think twice before you tweet something hateful—you could end up supporting a nonprofit you hate!